Making underwater microphones and working creatively with sounds and soundscapes. Sound ecology and environmental acoustic protection. A unique opportunity of art & biology learning in a marine natural reserve: Medes Islands, Girona Spain. 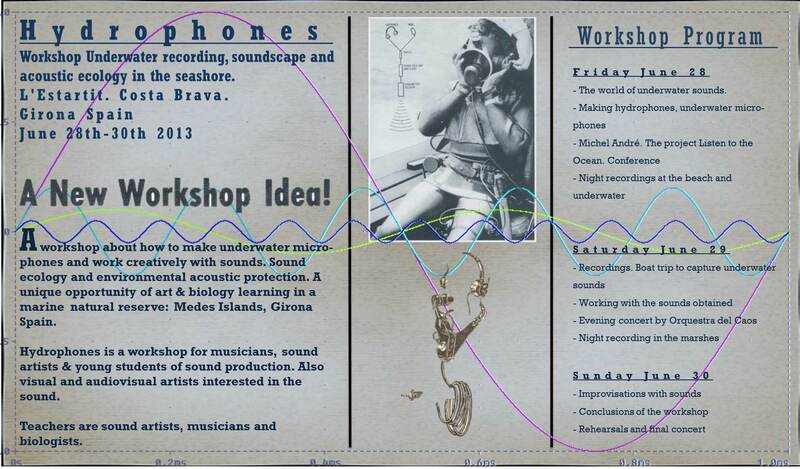 Hydrophones is a workshop for musicians, sound artists & young students of sound production. Also visual and audiovisual artists interested in the sound. Teachers are sound artists, musicians and biologists: Jose Manuel Berenguer, Carlos Gómez, Xavi Lloses & Michel André. Teachers are sound artists, musicians and biologists. – The world of underwater sounds. Composer and sound engineer documentary filmmaker. Professor of sound art multimedia systems in Barcelona. Project Manager of the Orchestra of Chaos. 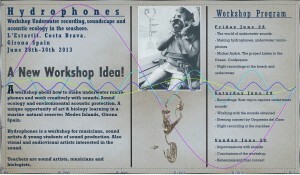 Sound artist, visual and audiovisual artist and professor at the School of Music of Torroella de Montgrí. MS in Biotechnology. Professor at the UPC Polytechnic University of Catalonia. Director of the Laboratory of Applied Bioacoustics (LAB). Researcher on the development of acoustic technologies for controlling noise pollution in the marine environment.